Rudy Buckley in NGVR/PNGVR Ex-Members Association parade dress. One of the most incredible discoveries to come to light confirming the departure of the Montevideo Maru1 from Rabaul with captive service personnel and civilians was from the eye witness account of a then twelve-year-old child. This led to further investigations with conclusive proof identifying one of the many soldiers being herded onto this unfortunate Japanese POW vessel. 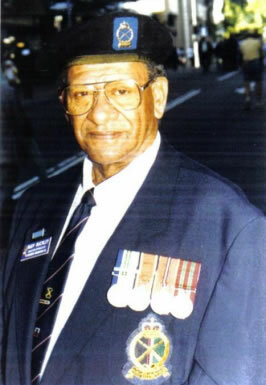 Rudy Buckley2, as a young child living in Rabaul with his parents3, was one of several children given camp jobs and various other duties by his Japanese captors one of which was cooking rice for the soldiers. They worked for nine to ten hours daily for a small sack of rice. known as 2/22nd Street towards this partly burnt out wharf. Rudy recalls that at this time the town was under aerial bombardment and squads of the captive soldiers were forced to take cover in a very large concrete rain water drain until the raid was over. After this he saw that they were then being taken by barges (of the type Rabaulites have later seen in the tunnels, i.e. a landing type barge with an armoured elevated steering position at the rear) from this wharf to the vessel anchored two to three hundred metres further out in the harbour. The loading of these POW in this manner took the better part of a whole day. Later that afternoon there was an allied bombing run over the harbour and the undamaged POW vessel left before nightfall. (black) ink. Rudy, being unaware of the significance of this name and serial number retained this memento and thought little of it. He kept it in a tin box along with Australian soldiers' badges and other items which remained buried at Ratongor about twenty miles from Rabaul on the north coast road, during the period of his family's captivity there. This would have occasioned severe punishment had his captors discovered the buried tin box. In recent years there has been substantial public exposure of the loss of the Montevideo Maru with its 1,053 service personnel and civilians. With the intensity of the Japanese bombing of Rabaul in January 1942, the acting Administrator, Harold Hillis Page, cabled Canberra for permission to evacuate from the untenable position at Rabaul, on the Norwegian vessel Herstein then loading copra in Simpson Harbour. The request was denied by the Curtin war-time government; the Herstein was bombed and burnt three days later sealing the fate of those in Rabaul. An active member of the NG & PNG Volunteer Rifles Ex Members Association, Rudy recalled around 2004 that he had a tin box at home containing various mementoes collected over a number of years and discussed this with another association member, Douglas Ng who thought the matter of significance. 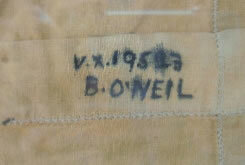 One of these was a handkerchief from a soldier more than 60 years earlier and still in its original condition. He notified the Association thereby establishing a link with one of the many captives who boarded this vessel. Leader. A full front page feature article was published on 4 June 2008. There was nothing for over a week and then a single phone call. One reader phoned details of a lady in North Balwyn, an adjacent suburb, who might have information. At that address, I was given a name of the former owner as well as an address of a woman who had moved to Queensland. Carole came to see me on 7 July 2008 and allowed me to copy her mother's documents. After the letters stopped arriving from Rabaul and with the fate of the Rabaul captives not known for some time, Grace married some years later and became Mrs Grace Baker. Late in 1945 Australian families, following an investigation in Japan by Major H. S. Williams, received notification of the deaths of those on the Montevideo Maru. As Grace had then married it is thought unlikely that the O'Neil family in their grief (a cousin of Barry's had also died at Singapore) conveyed this news to Grace. It was not until she received a letter dated 11 November 1963 from the Commonwealth War Graves Commission that she was advised of Barry's death on the date of the torpedoing on 1 July 1942. On a broadcast on ABC radio Macca's Australia All Over on Sunday morning 20 June 2010, Carole visiting Canberra in connection with the long overdue Federal Parliament recognition of the greatest maritime loss Australia has suffered stated that the discovery of the handkerchief, which her mother viewed at the Association's museum shortly before her death in 2008, finally brought closure to her after more than 60 years. remarkable eye-witness account, there is positive evidence from a Japanese seaman, Yosiaki Yamagi, now the sole surviving crew member, that prisoners were confined below decks on this vessel when torpedoed. This was proven when Albert Speer, MBE, of Sydney working in conjunction with Hisashi Noma, a Japanese historian and author of a book on the history of the merchant fleet of the O.S.K. line, located Yamagi after an extensive search. We know that the Rabaul officers and nurses were taken to Japan on the Naruto Maru, which left Rabaul at about the same time and, in due course, survived their captivity in Japan. Japan regarded captive prisoners a slave labour and it is highly likely that those captives from Rabaul were being conveyed to work in Hainan mines; why would they eliminate such a large number of labourers on an otherwise empty vessel returning to Japan? The Montevideo Maru was one of the vessels built for the South American trade by the Osaka Shosen Kabushiki Kaisha (later the OSK line) in 1926 and, commandeered by the Imperial Japanese Navy, departed Rabaul on 22 June 1942. It was torpedoed on 1 July 1942 with the loss of all the 1,053 prisoners of war off Cape Luzon, Phillipines. 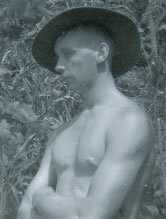 William Reuben Buckley, born 7 November 1896 at Rabaul, a mechanic, was forced to work for the Japanese. He was at the Japanese navy workshop in the former Burns Philp garage situated in Mango Avenue opposite Colyer Watsons when accused by a Japanese civil administration officer named Seki of deliberately slowing a vehicle repair. When telling that spare parts were not available, he was accused of lying and cruelly bashed 16 times with a crank handle leaving him with extensive injuries. This was witnessed by a friend, Philip Taligatus. Another Japanese, Machiheso, directed that the wounded and bleeding William be taken to where the family were living at Ratongor, where he died four days later of his injuries on 7 March 1943 and was buried there. The letters mention personal family matters; describe a little of service life with three weeks' exercise in the bush; received Christmas parcels and magazines; attacked by a coconut crab; how he hoped to be back home for his sister's wedding; the Chinese have shut up shop and Rabaul is dead at night; they had a good Christmas dinner better than the bully beef; beer ration down to half a bottle per day; there had been an air raid; etc. In 1964, the Commonwealth Government made a distribution of Japanese assets to dependents of former prisoners of war and the amount of eighty six pounds in respect of his service was paid to Corporal O'Neil's mother. A further payment of sixteen pounds ten shillings was payable but by that time she had died. With the exception of indigenous natives, the status of other persons born in New Guinea was that of Australian Protected Person. Our daughter, Vanessa, born in Rabaul, was at first given this APP status until eventually, after completion, payment for and swearing of a number of forms, naturalized by the signature of the District Commissioner, Harry West. Major William Barry O'Neil, VP7545 of the pre-war (Victorian) Australian Instructional Corps ( a permanent military force within the Australian Military Forces). Died on 18 December 1946 aged 63. His wife, Beatrice Laura, died on 5 June 1957, aged 71. Their graves are in Box Hill Cemetery. Mahala Eleanor O'Neil, born 20 March 1912. She joined the Australian Womens' Army Service on 19 January 1942 four days before the fall of Rabaul. She served until 17 January 1946 at rank of Warrant Officer Class 2. She never married and died c. 1978. Harold Buckley, burn 28 April 1926 at Rabaul, served on the Desikoko until 8 July 1942. He had a distinguished record of war service also serving in Malaya and later Vietnam. He was the elder brother of Rudy. He was awarded the R.S.L. Meritorious Service Medal. He lives in New South Wales. The W.R.Carpenter vessel Desikoko (desiccated coconut) left Rabaul on 8 December 1941 for Brisbane to pick up supplies. On the way back to Rabaul, in January 1942, she was diverted to Samarai where she collected evacuees and conveyed them to Australia. A short while later as the USS Desikoko she was commandeered by the United States Army Small Ships unit. 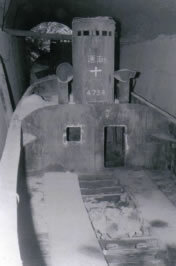 A recently located photograph shows this vessel named on the stern MONTEVIDEO MARU OSAKA (port of registry) over the seven hiragana characters. Subsequently Mr Hisashi Noma, who is a world expert on the OSK line, identified a photograph of its namesake built in 1956 and used in the South American trade until 1981 when it was scrapped. This more modern vessel also bore the name MONTEVIDEO MARU under seven hiragana characters and was pictured with the Oakland Bay Bridge in San Francisco in the background.